Dubai: Dubai is proving to be attractive not only to migrant workers but to new species of birds as well. Hundreds of migratory birds have taken residence in Al Qudra Lake after improvements were made in the area. Some 130 species of birds have been spotted and recorded in Al Qudra Lake by Dr Reza Khan, Specialist, Wildlife and Zoo Management, Public Parks and Horticulture Department at Dubai Municipality, during his field visit. Another dozen bird species are awaiting confirmation of their identities. The lake, located in the middle of the Seih Al Salam desert and Bab Al Shams, was created and managed by the civic body as part of a project to green and enrich that part of the desert of Dubai. “Most [birds spotted in the area] are migratory, barring two dozen species. Al Qudra’s main attraction is its freshwater body covering about 10 hectares where the areas covering it have been planted with fruit trees and trees that give shade,” Dr Khan told Gulf News. Dr Khan clarified that many of the birds found in the lake are native to the region such as the Arabian babbler. So far, there are no known endemic bird species to the UAE. During his field visit, Dr Khan spotted eight Lappet-faced vultures soaring over the lake and its neighbouring areas for nearly two hours after 10am. The vultures often come within 200 to 300 metres near the ground to hunt for food. Dr Khan said this was his first sighting of a large number of the endangered vultures within the area. Other birds sighted in the lake include the Glossy Ibis, Caspian Plover, Sanderling, Ruddy Turnstone, Gull-billed Tern that prefer coastal areas. Mainland and migratory birds include the Eurasian wryneck, Rosy Starling, Common Starling, shrikes, Wheatears, eagles and falcons, among others. Dr Khan said the birds have favoured the lake because of the development in the area. 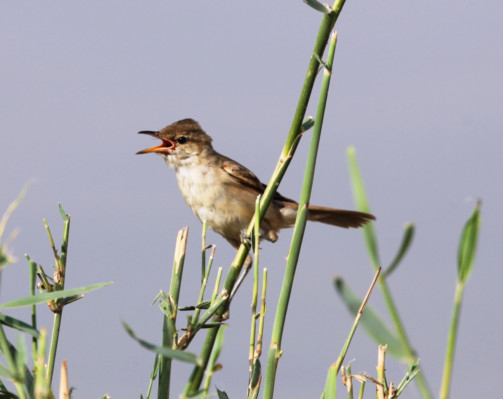 “At least 40 per cent of the bank has been covered with reed beds that provide shelter and breeding places for many wading and water-loving birds as well as warblers,” Dr Khan said. Currently, Al Qudra Lake is the only lake in the neighbourhood of Seih Al Salam open to birdwatchers. It is one of at least six other huge freshwater bodies created by the office of the Engineers of His Highness Shaikh Mohammad Bin Rashid Al Maktoum, Vice-President and Prime Minister of the UAE and Ruler of Dubai.